The Romans first invented the onager, which is what we have in this set, sometime between the third century BCE and the fourth century CE. Ideally we would like to be a bit more precise than that, but unfortunately there is as yet insufficient evidence to make that happen. Perhaps what we should say is that the onager is first documented in the fourth century CE, but an occasional hint in earlier writings seem to suggest it may be an older machine, although no one knows and most modern writers take a cautious approach and describe the onager as a late empire invention. Whenever it did make its debut, there is no doubt that it did become a weapon in the Roman arsenal, and it has been modelled before in this hobby, so time to take a look at this latest version from Strelets. Beginning with the engine itself, unfortunately there is no definite surviving evidence for how such machines were designed, and over the years several different reconstructions have been made, any of which could be reasonable. The general design here looks plausible to us, and closely resembles the machine in the Strelets set Shaab with Crusader Crew , which is because it is the same sprue but with some alternative pieces used. Unfortunately the medieval version has no historical credibility, and while the Romans certainly did use such a machine it varied from this model in two important respects. First, all the evidence, as well as some common sense, tells us that the Romans used a sling at the end of the arm to hold the ammunition. This was an important aspect of the performance of the weapon, and the spoon on this model is a mistake or fabrication of medieval copyists which has often been repeated in films and elsewhere where historical research has been sloppy or non-existent. Unfortunately it is all but impossible to correct this big mistake on this model, although another big mistake is much easier to remedy - onagers had no wheels, so those shown for this kit should be left in the box (Barker claims they did have wheels, but seems to be in a minority of one, with all the later works disagreeing). The final major problem with this model is the pad on which the arm is cushioned once it reaches the top. Logic dictates that this must be a substantial piece of padding since it hopefully has to protect the frame from a powerful force exerted by the arm - that was the whole point of the exercise. The 'pad' on this model is almost none-existent - more the kind of thin polystyrene sheet you find in product packaging today to protect a surface. Smaller issues include a lack of the metal fittings that made the thing work, and the feeling that the whole frame is a bit elaborate for such a machine. And what of the figures that accompany this less than perfect piece of artillery? Well as we have said the target time period is potentially very substantial, so nothing here is outside the bounds of historical appropriateness. However there are a lot of surprises here that really just look all wrong. First of all an onager was a siege engine - it was extremely difficult to move and therefore change aim, so was used against things that could not move out of the way, such as walls. However to be effective it had to be fairly close to the target; certainly close enough for the crew to be vulnerable to archery and counter-battery fire from the ramparts, so it is amazing that half the crew wear no armour, and astonishing that one man has stripped down to his underwear, thus removing everything that announces him as a soldier. Another question concerns the poses. Let’s take a guess at what these men are doing. Numbers one and two in the first row are obvious enough - they are using the winch to pull the arm back against the rope spring, so they are fine. Numbers three and four seem to be pulling on near-vertical ropes, but it has been suggested that these are supposed to pair up with the men on the levers to add to the pulling weight. If so then the bases preclude such an arrangement, and even cutting away the bases leaves a pretty rough match for one pair, and a quite impossible one for the other. The last man in the top row is using a hammer, probably as part of the trigger mechanism. Row two has a man with a torch. Obviously he is about to ignite some projectile, but as we have said the projectile would be in a canvas or leather sling, not a spoon, so wouldn’t that just burn the sling too? In any case, this is primarily a machine against walls, which are not worried by fire. You might want to send fire bombs into an urban area, to set fire to buildings, but that is not what this machine is mainly about. This smacks to us of someone watching the opening scene from the marvellous but thoroughly unhistorical film Gladiator (2000), and assuming what they were watching was historically reliable, which it was not. Next we have a man using some dividers on a slab. Presumably he is supposed to be aiming the device, but we find it highly unlikely that aiming was done with this precision or in this way. This man seems to wear a really bad representation of a toga, just about the last item of clothing you would expect to find at a siege! The next man is uncontroversial, simply looking at something while shielding his eyes, and the last piece is of two legionnaires assisting a third, which is nothing to do with the onager but quite nice nonetheless. So very few of the poses have much to do with the weapon. Their sculpting is the usual Strelets rather chunky standard, with moderate amounts of flash and fairly realistic poses. Yet apart from the obvious fillers that have nothing to do with artillery there are few poses that make sense with the weapon. What it really needs is men fetching and loading ammunition, and perhaps attending to the frame when it gets damaged, but there is none of that here. The weapon too has some really quite major errors which will be a considerable challenge to put right, so we find ourselves struggling unsuccessfully to be positive about this whole set. At least the onager is not too hard to put together, despite the most basic of instructions, although this is certainly far from a 'snap-fit' kit. A basic lack of understanding of how such machines were made or operated means there is little here that will be of much value to those with a penchant for Roman sieges, which just goes to show the dangers of referring to medieval illustrators or Hollywood producers for information on the past. Very annoyingly, all the mistakes made in the model are avoided in the far better illustration on the box. 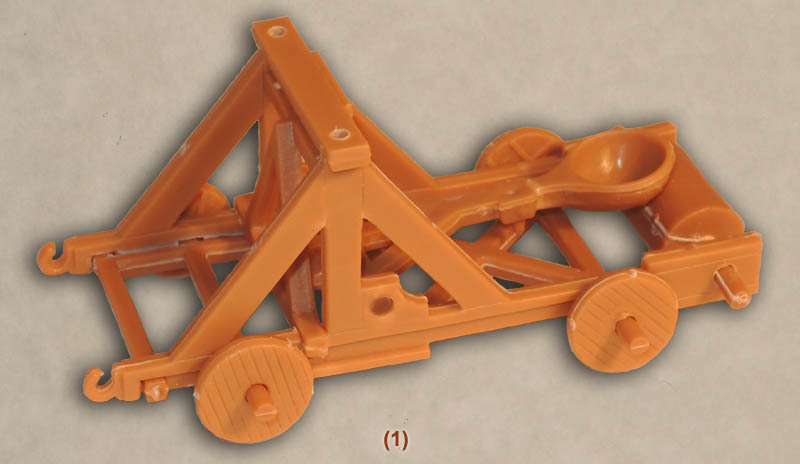 The re-enactors obviously knew what an onager looked like, so why didn't the sculptor?